GSC is a free service that allows you to keep track of your website’s health, track your site’s organic search traffic, and tell the Google search engine what your site is all about. You can sign up here: https://www.google.com/webmasters/. In our opinion there is no better free tool available that provides so much actionable information about your website. By actionable, we mean you can look at real data about your site, see what’s working and what’s not, and take steps accordingly. If you haven’t already set your site up with GSC, do so after reading this blog post. 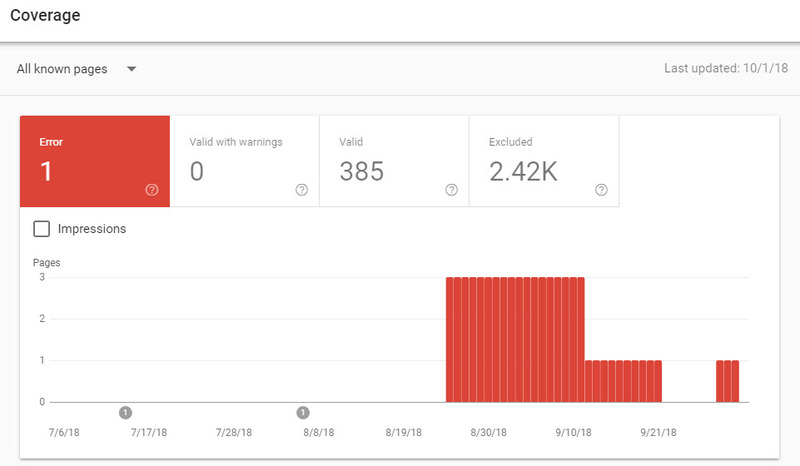 What Can I do with Google Search Console? There’s just not the space to give an exhaustive account of what you can do. Go exploring. But the features we mention above are worth spending a bit of time on. Once you’ve got your site added to GSC (see below), you can check in (or you may even get alerts) if Google notices problems with your site. Maybe you’ve got a bunch of “page not found” errors because of a recent major change to your site. Maybe too many redirections. Whatever the case, it will identify issues that need to be corrected, as those problems will be causing issues for visitors, too. In the image below you can see a small amount of the data GSC provides. The figures show Google web searches that have resulted in the site appearing in search results (Total Impressions) and how many clicks were earned from those searches (Total Clicks). It also provides in this snapshot the average click through rate, or CTR, and the average position site content appeared in search results. In this case, it’s position 29.5, the third page of results (but that’s for every search term, not necessarily the ones we really care about). The data below are over the last three months, which can be expanded or contracted as you like. All of that data are trackable over time. Do we have more clicks than before? More impressions? Are more people clicking on average (CTR)? And very importantly, can we link traffic improvements to something we did on (or off?) the website? Maybe new content or a new SEO approach or more links from third parties, or perhaps we held an event? Whatever’s working, let’s do more of it! Whatever’s not working, let’s change it up somehow. Also importantly, GSC provides data on actual search terms used to make your site appear in search results. If you use Google Analytics (GA), you will know that most often GA, because of privacy concerns, declines to reveal search terms used to find your site. Icing on the cake? All the data can be downloaded and reviewed in the software of your choice. The chief way to let Google know about your site is to submit an XML sitemap. We most often use the free Yoast SEO plugin on WordPress websites to dynamically create and modify XML sitemaps. Once Google has the sitemap in its system, it will revisit it over time. If you engage in substantial changes to your site, you can always resubmit the sitemap. Look to the Coverage, Sitemaps, Manual Actions and Events sections of GSC to search for potential errors on your site. Google substantially changed how GSC appears earlier in 2018. You may also wish to use the old version of GSC and its “Data Highlighter” function to tell Google about specific content on your site, such as products, business location information, or events. How Do I Set Up GSC? GSC is pretty easy to set up. Get yourself a free account. If you already have a Google account, you’re half-way there. Then you’ll “add property”. That’s your website, the exact address, such as https://goatcloud.com (your website is HTTPS by now, right?!). Use one of the many methods available to verify you control that domain (or have your developer do it). Once you’re verified, you’ll want to upload your XML sitemap. When I add a new site to GSC, I’ll also tend to tell Google to “fetch” and “render” the site. We want to make sure the site is in Google’s index. Let’s face it, some people do use Bing to search (would you believe about 24% of searches are Bing searches? Source: comscore) so it’s also important to tell Bing what your site is about. You can submit your XML sitemap at BWT just like you can at GSC. And you should. Because each tool, GSC and BWT, was created by humans, neither is perfect. Sometimes you can find data in GSC that you won’t find in BWT, or vice versa. Look at them both to gain a solid understanding of how your website is working. Why Should I Bother? Won’t Google and Bing Just Find my Site Anyway? Over time, it’s quite likely that Google and Bing will find your site and index it, even if you do nothing, so the site will eventually appear in search results. But few successful businesses are so passive. And if you don’t bother to review your site with these tools, you’ll never know what Google and Bing see as problems with your site that are preventing it from doing better in search results. Nor will you get the data that show you what’s working. See what I mean about getting GSC set up today?